With an average of nearly 6,000 Tweets per second, what does your brand do to stand out among the crowd? Posting content in the moment is risky in the fast-paced and ever-changing Twitter environment. However, learning how to schedule Tweets can be a strategic way to save time and reach bigger audiences. 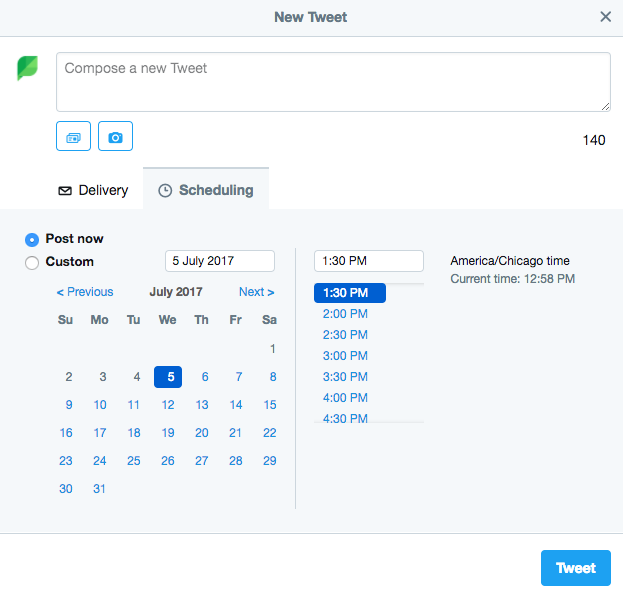 Scheduling Tweets isn’t just for brands on holiday or to send Tweets after work. When you schedule content, you’re putting more emphasis on effective posting times and maintaining a consistent message with continuous content. Twitter requires a strong content strategy to supplement your day-to-day marketing and engagement. And in this article, we’re going to show you how to schedule Tweets to bolster your Twitter content strategy and save time. The native Tweet scheduler only lives in the Twitter Ads portion of the Twitter dashboard. You can access it by clicking the blue Compose button or by using the Creatives tab in the Twitter Ads panel. From there, you’ll draft up your content and select the Scheduling tab to determine a day and time to send it out. If you’re not using Twitter Ads, or want a more cohesive experience with your various networks and profiles, Sprout Social offers an extremely robust set of social media publishing tools. Planning your social media content in advance is one of the smartest things to do as a marketer. This allows you to work on campaigns, focus on promotions and launch product updates cohesively, without confusing your audience. If you’re planning out your content, you can work ahead to get content scheduled, in the queue and ready for publishing. This will save time whether you’re a mom and pop shop managing a single profile, or an agency in charge of dozens. With the help of a social media management tool like Sprout, it’s easy to get Tweets on the social media content calendar weeks or months ahead of time. You can even have content recur with the simple click of a mouse. Click the Compose button, and begin drafting your content. Click the calendar icon, select the day(s) you would like to publish and enter a time. More likely than not, all of your content isn’t necessarily time sensitive. In fact, you should never turn your social on “auto pilot” and walk away. To see engagement and more participation from your audience, you must maintain an active social media presence. Not only should you be active on social, but it’s important to be present on networks like Twitter throughout the day. It’s smart to provide thoughtful, relevant posts to drive engagement with your audience, but that doesn’t mean you have to manually post every message. 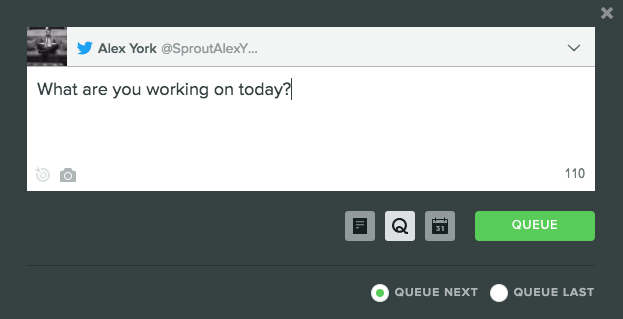 Instead, use Sprout to take out the tediousness of manual posting and scheduling each and every Tweet. In fact, we developed an elegant way to quickly schedule future content without needing to manually set a day and time every time. 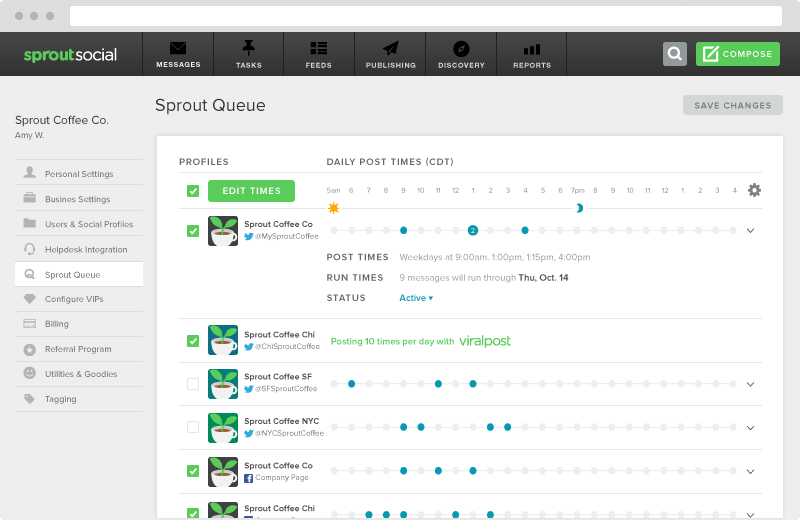 The Sprout Queue can be configured by Sprout account owners to Tweet a maximum of 10 times per day. You can choose between setting your own send times manually (if you’ve already used the Sent Messages report to find out when your audience is most engaged) or by using ViralPost, an algorithm Sprout has developed that automatically learns the best moments to share your content. It’s a breeze to configure these settings for one or multiple social profiles. Once your Queue settings are in place, you won’t have to manually choose times for that great industry think piece or the helpful product tips you share with your audience. Fun fact: you can also press ‘N’ on your keyboard to quickly open the compose box. Click the Actions menu (little gear icon in the upper-right corner of the application), and select Sprout Queue. Select one or more profiles and click Edit Times. If choosing times manually, type in the exact times and add up to 10 as needed. If using ViralPost, simply select the maximum numbers of posts per day as well as the active posting time frame for weekdays and weekends. To keep your content unique and fun to follow, it’s smart to be ready to post at any moment. You never know when a great idea will come along. But with Sprout, you’re always ready to create and publish with ease. Queue great stories from the RSS Reader (just make sure to set up your Feedly account in Sprout). You can also queue content by using the browser extension or even quickly approve a draft in the Scheduled tab. Queueing up engaging content only takes a couple of clicks with Sprout’s Compose box. Whether you’ve scheduled times manually or you’re using ViralPost, the Sprout Queue is a perfect way to get great content in front of your audience’s eyes. Using Sprout’s full suite of publishing tools will save you a lot of time and guesswork, allowing you to focus on more personalized interactions with your audience. After your content is scheduled and ready to go live, you likely have a few people who want to cross check your content. If you scheduled a ton of content in Sprout, you might be looking for a way to share it without creating more logins for people who’ll never use it. Within the the Publishing feature, select the Calendar. From there, you can select the List or Week to change your view. 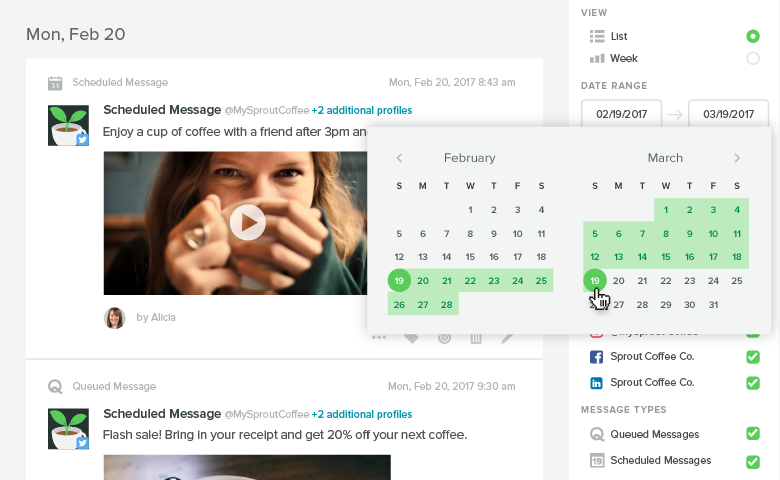 Then you can choose your Date Range, Profiles and Message Types. To download your calendar, select Export PDF or enter the team member’s email addresses for direct sharing. 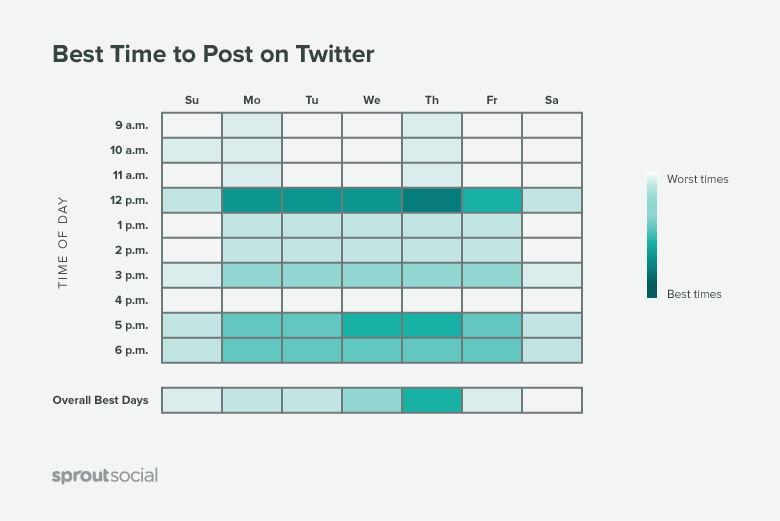 You have your content, you’re ready to schedule, but do you know the best times to post to Twitter? While there’s no dead set or exact time we think you should post, our research shows unique time frames that could help increase your impressions and engagement. The most recommended day to post is Thursday. The strongest days to post are Monday through Thursday. The most active time throughout the week is Thursday at Noon. The safest ranges to post include any weekday between noon and 3 p.m. The least recommended times to post include early mornings and late nights. Again, this can all vary based on your audience, but you can use the data above as a good starting point. We really hope this article was helpful in explaining how to make the most out of Sprout’s publishing features to schedule tweets. Any questions or feedback? Give us a Tweet. If you’re interested in trying this for yourself, sign up for a free trial and give it a shot!